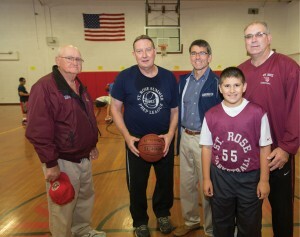 Left to right, Parochial League Founder Chuck Haven; Coach Gary Dembkowski; former player Pete Taylor; former player Mark Baker and his son, Mike, who currently plays in the league. 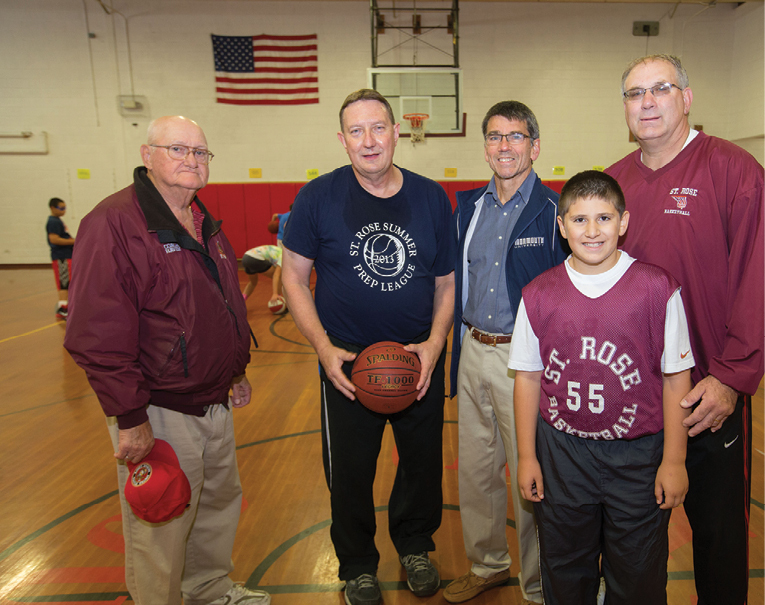 Ask Chuck Haven, one of the original forces behind the creation of the Parochial Basketball League for elementary school students in the Diocese of Syracuse, just when the league actually started, and he’ll start to laugh. “My wife says it was over 100 years ago, but I think it’s somewhere around 30 to 40 years ago,” he said. Haven, 78, recalls at the time he helped start the league in the 1970s, he was the father of an elemen­tary school student attending St. Rose of Lima School in North Syracuse, New York. “Father Esposito approached me and asked me to check if other schools had an elementary basketball league. There was a Parochial League in place for the high school kids, but there really wasn’t anything for the grammar school kids. After doing a little research, we found out no one else had a league for this age group, and we decided to start our own. The funny thing is Father Esposito is now retired [from the league] but I’m not,” laughed Haven. Although Haven did eventually retire from his full-time job at General Motors, he is still actively involved in the Parochial League, helping to coach along with the talents of Mark Baker and Gary Dembkowski. Baker played for the league when he attended St. Joseph’s School in Liverpool, New York, and was actually coached by Haven. Baker now returns the favor as a volunteer coach for the league. “I got involved as a coach because my children wanted to play in the league,” explained Baker. “I have three boys, ages 11, 13 and 15, who were all attending St. Rose at the time. A cousin of mine was running the league, so I figured I would volunteer to help while the kids were in the school. Now, my oldest is now at Bishop Grimes, but I’m still coaching the league,” said Baker. Coach Gary Dembkowski instructs students on the finer points of the game as part of the Parochial Basketball League. Dembkowski, the athletic director at St. Rose and a coach at Cicero North Syracuse High School, also volunteers for the league, helping to coach over 300 players from nine diocesan Catholic schools in the sport of basketball, as well as teaching them the art of good sportsmanship. Like Baker and Haven, Dembkowski became involved in the league when his oldest son wanted to play over 25 years ago. “I was involved in basketball and running a program in the town of Cicero and offered to help with the Parochial League,” said Dembkowski. “It’s amazing to look back and see that Chuck had this vision of a league and put it all together and it’s still going. He still puts in about 60 hours a week, although he’ll tell you he’s just ‘helping out.’ He’s like everyone’s grandfather, and all the kids in the league are lucky that he’s still around and involved,” Dembkowski said. The Parochial League has three levels: A and B divisions for boys and girls in Grades 4, 5 and 6, and a C division for younger students (kindergarten through Grade 3), which combines both boys and girls on a team. Tryouts are held each October and practice begins in November. Games are played Sundays from December through January. For the younger players, coaches focus on teaching the basic skills of the game such as dribbling, shooting, and learning the positions on the court, as well as putting an emphasis on making friends and being a good sport. As they move up in the divisions, coaches emphasize to players the importance of teamwork. Haven points out that the strong friendships created over the years between players in the league have been largely due to the fact that Catholic schools were, and still are, all about faith and family. “Back in the day, every parish was connected to a school, and there was a commitment as a faith-based organization to provide fun activities for the kids. That’s what still keeps this legacy going: the commitment to the kids.” Haven said. 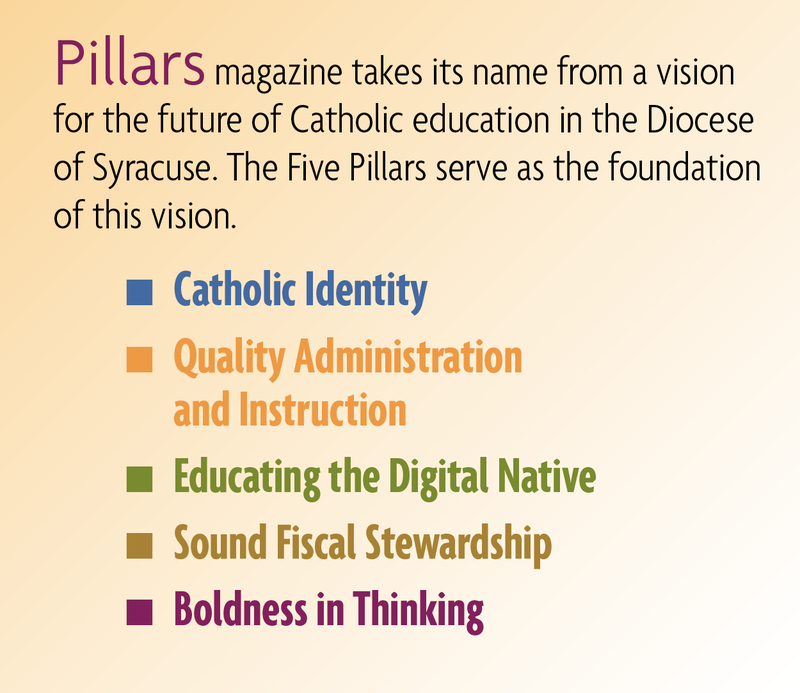 The schools that currently participate in the Parochial League are St. Rose in North Syracuse; St. Margaret’s in Mattydale; St. Mary’s Academy in Baldwinsville; Holy Family in Fairmount; Most Holy Rosary in Syracuse; Cathedral Academy at Pompei in Syracuse; Blessed Sacrament in Syracuse; Holy Cross in DeWitt; and Immaculate Conception in Fayetteville. “The league has changed a lot in 25 years. When it was first formed, we had so many teams because there was no other option for these kids. Today kids are spread thin, playing everything from soccer to karate, not to mention electronic games,” Dembkowski said. Despite their hectic schedules, the kids involved in the league are still making friends and having fun, just as their parents did 40 years before. Michael, who plays point guard, wants to be a basketball player when he grows up and credits the league to helping him learn how to play the game. “The coaches are really nice and help me with my game. When I was little, my cousins were in the league and now this is something fun I can do too. And my parents always come to the games… they are probably my biggest fans,” he said. Ben Volissis has played for the Parochial League for the past two years and is also a 6th grade student at Immaculate Conception. “I like playing in the league. It doesn’t even matter if you don’t win because you get to play with your friends,” he said. When Haven looks back at all the league has accomplished since its beginning and all the students it has taught, he is proud but still believes there’s more work to be done. Pat Shea is the associate editor of The Catholic Sun.